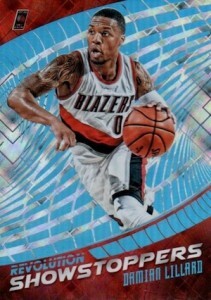 A new NBA option in the Panini arsenal of products, 2015-16 Panini Revolution Basketball features a foil-centered look with a mix of background designs. 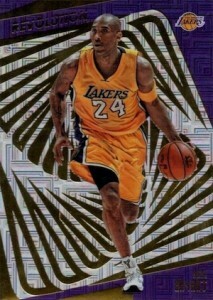 Boxes yield multiple parallels and inserts. 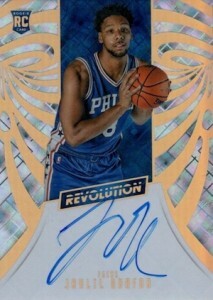 While the design is anything but subtle, Panini Revolution is a fairly simple release. 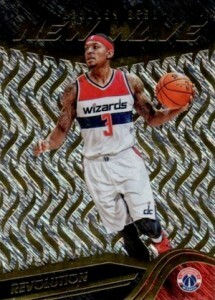 Totaling 150 cards, the base set includes 100 veterans and 50 rookies. Among several foilboard parallels, Galactic are the most rare at 1:288 packs. Cosmic, Sunburst and Futura are other options that combine to drop one per box. While not the focus of the release, Autograph cards average two per eight-box inner case and include rookies and veterans. Tweaking the base design, several inserts close out Panini Revolution with a few more choices. New Wave highlights young stars, Showstoppers honors the biggest names in the league and Rookie Revolution covers the 2015 NBA Draft class. 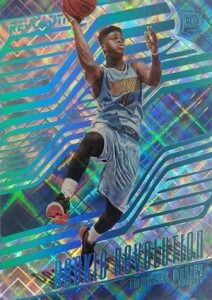 UPDATE: Panini announced that 2015-16 Panini Revolution Basketball has only on-card autographs and the signed cards are all live in packs except for Blake Griffin due to his injury. Master cases guarantee one autograph from the following group: Andrew Wiggins, Chris Paul, D’Angelo Russell, Devin Booker, Jahlil Okafor, Karl-Anthony Towns, Kevin Durant, Kobe Bryant, Kristaps Porzingis or Kyrie Irving. 47 cards. Average approximately two per eight-box case.